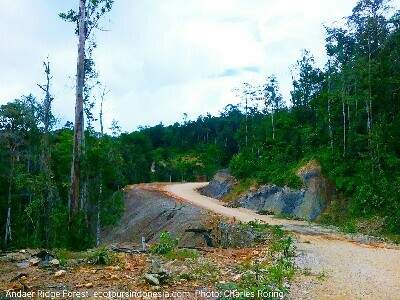 Andaer ridge forest is a new birdwatching destination in Vogelkop region of West Papua that I am trying to promote at this blog. I went there last week and spent a few days in the area enjoying hiking, birding and observing its plants and flowers. To do birding, I brought a good pair of Visionking 10×42 mm binoculars, and a D-SLR camera with Tamron 150-600 mm G2 super-telephoto lens. I also brought the records of the bird sounds that I saved in my tablet. However, I chose to fully rely on my eyes and binoculars. To reach the forest, I went by a chartered 4WD car. Andaer is located in the transition zone between lower and higher elevation forests. 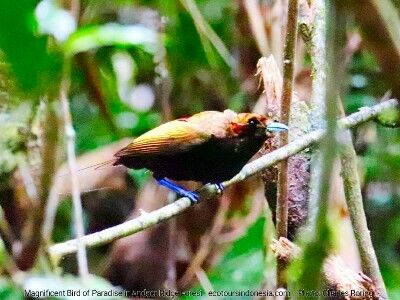 Therefore, during the birding walk, I could see some birds that usually live in the warm area of West Papua. Some of them were Blyth's Hornbill, Yellow-billed Kingfisher, White-bellied Cuckooshrike, Black-capped Lory, Sulphur-crested Cockatoo, Eclectus Parrot, Palm Cockatoo, Wompoo Fruit Dove. For birds of paradise, there were Lesser Birds of Paradise, Magnificent Birds of Paradise, Magnificent Riflebird. 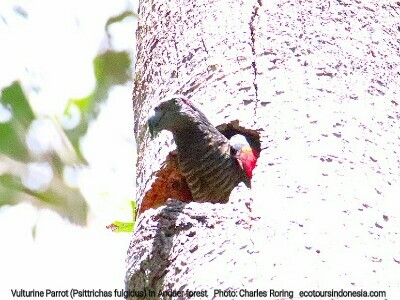 From my previous trip in the same forest, I saw several Vulturine Parrot eating fruits at a tree near the roadside. This time, a local villager told me that he found the nest of the parrot. It was an interested news. I decided to visit the nest the next morning. It took around two and a half hours to reach the nest. It was located in a hole of a dead tree some twenty meters above the ground. I carefully walked closer to the dead tree hiding my body under the green leaf of tree brances above myself. Sudden, the Vulturine Parrot came out of her nest. Perhaps she heard the noisy sounds of our movements on the ground. She observed us quite long. I carefully turned on my camera and aimed it at her. I shot her a lot of times using different settings of the camera so that I could get the perfect photograph. I did not realize that the memory inside my camera finally reached its maximum storage capacity. It was full. I could not shoot the bird any longer and I lost the most precious moment of her gliding out from her nest before flying fast leaving her nest to find food. The bird is also called Pesquet's Parrot. In field the guide book Birds of New Guinea written by Thane K. Pratt and Bruce Beehler, it says that Vulturine Parrot has been widely extirpated. IUCN has put it into Vulnerable status. To raise awareness about this situation, I introduce ecotourism to Andaer forest. I hope that local villagers will stop hunting the bird and work as local guides who bring tourists to the forest to watch Vulturine Parrot and other tropical birds that live in the region.